Did you know that today is a great day? Well it is and I figured that there is no better way to celebrate a great day than with a Creative Knockouts Challenge where one lucky person is going to walk away with THREE, yep that's right 3!! prize images from our wonderful sponsor, Star Stampz. Now that's all fine and dandy, but what exactly is the challenge this week?!!... well we over at Creative Knockouts would love to see bows on your creations so whether they are big, little, tied string, or even cut out from paper add them this week and then come and show us what you have created. 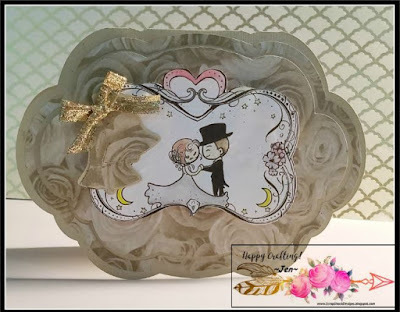 For my project, I decided that wedding season is right around the corner and bows are the perfect accessories at weddings so why not use the Wedding Romance image, of course from Star Stampz, and create a lovely card. This card was super simple to put together. The base uses a cut file from my Cricut Design Space which I decided to layer using 3-D tape. I then went ahead and cut out some wedding bells and attached a gold bow to the top. The file had some cute little paper bow/strings but I thought the glitter looked much better. As far as the image goes, I decided to keep it light and used my watercolor pencils along with a blender pen. It's hard to tell from the photo but the background of the image is also colored in with a faint blue and then I applied some glitter over the entire image, making sure not to add too much. Here is a closer view of the image. Coloring images can be intimidating but what I am finding out is that, like most things, the more your practice the better you get. So now I am leaving you with some of my mom encouragement as well as a challenge. 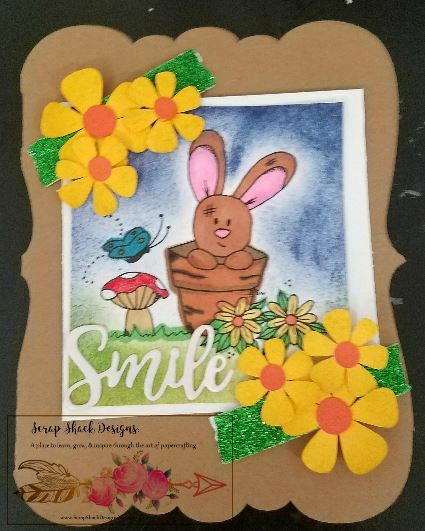 Happy Crafting and I hope to see you over at Creative Knockouts. 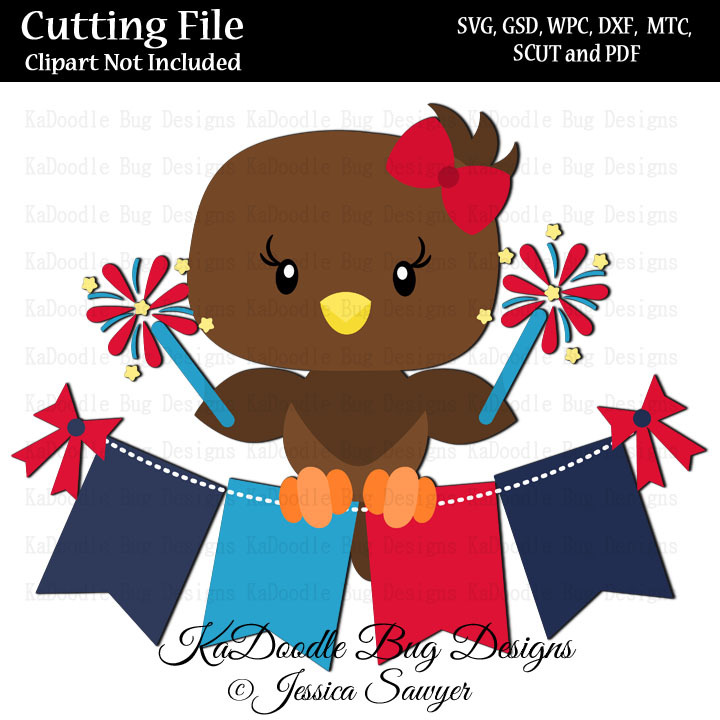 Today I decided to take a really cute, super patriotic, Kadoodle Bug Design file and add it to the family wall calendar. 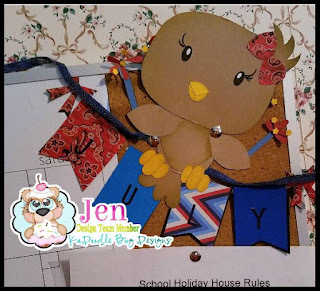 Now I am a little out of date with making home decor pieces, but I figured since Doo is so dependable on the calendar during the school year, who am I to throw him off during the summer, plus did I mention this is a super cute file?! My dry erase markers also know that summer is here and have decided that they no longer need to contain ink, so I guess I have to head out and get more of those too. It's a good thing July is not here yet because obviously I am not ready for it. 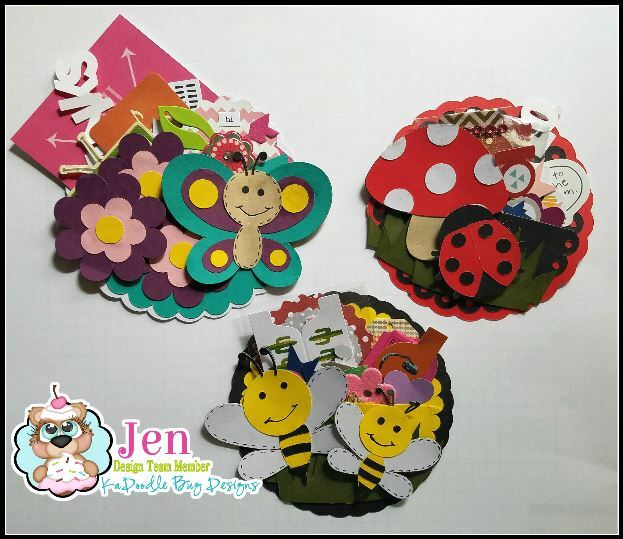 Ok so on this project I used the wonderful cut file from Kadoodle Bug Designs. This file is perfect for almost any summer month or summer holiday and is called JS Sparkler Eagle. The cool thing about this cut file is that the banner is blank so you can use any papers or sentiments that you desire. Other than the cut file I ended up using a bunch of supplies from my stash. The paper came from The Paper Studio's "All Season's 3" paper book, which is always a great pick up for holiday themed papers throughout the year. I also used blue burlap for the twine and black sticker letters to spell out "July." I also ended up cutting out a smaller eagle die cut that I ended up making a card out of. Just to give you some additional ideas on those flags, on the card the letters spell out "HB2U" for some of these upcoming summer birthdays that I have. In fact I created a couple of different projects with this file, I loved it that much and it's so easy to cut out, but you will have to wait until Thing 3 arrives before you see the other adorable projects. Anyway back to this project, which measures 12"x 12" and fits perfectly into my family photo album. I had some left over paper from a camping mini album (stay tuned) that I created so I went ahead used that up for the background pockets (giving some extra color to the layout.) The paper is called "Happy Camper" and is a 12" x 12" book kit (with matching stickers) from Echo Park. Again all of the embellishments and titles came from the KDB Bear Silhuoette file and of course I had to use that lovely scripted title for my title card. 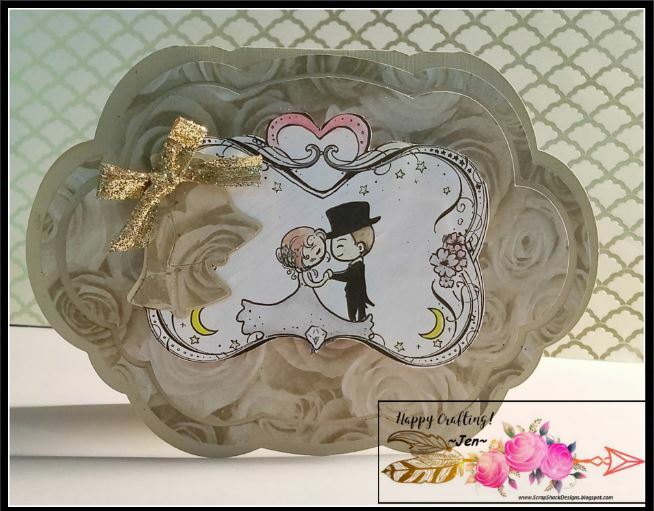 Because I did not want to embellish too much, not only is it a masculine layout but the cut file is designed to be simple, I had to get creative with the layers and the white doodling gel pen. Of course the baby bears were our favorite part of the whole park. There were two bear cubs and the were so playful and fun to watch. Not to mention the bears match the cut file and fit into the layout perfectly. Wanna know a secret? These pockets are actually envelopes from the CTMH Artbooking cartridge. 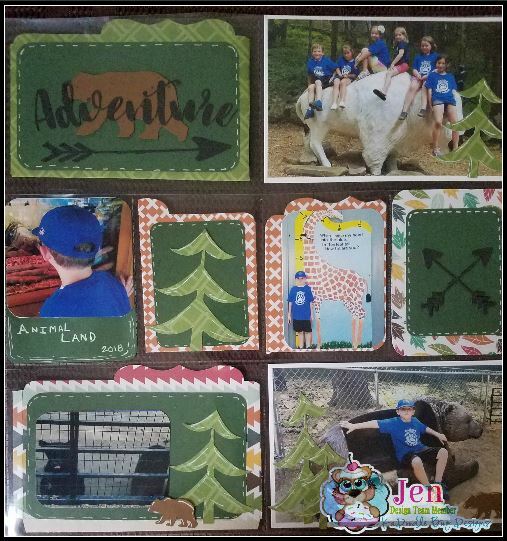 Using a pre-made envelop made cutting out a bunch of them super simple and again it really helps to hold all those extra photos or souvenirs from the park. 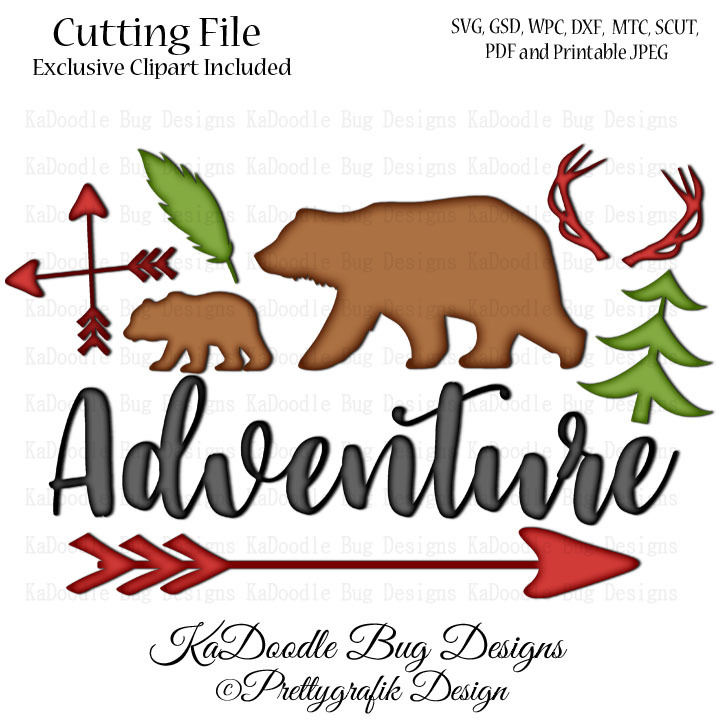 Here is a copy of that Bear Adventure Silhouette cut file just in case my post today inspired you to create something wonderful. Don't forget to cut out extra pieces to keep in your stash!! Thanks for stopping in today and happy crafting. Hi Guys! 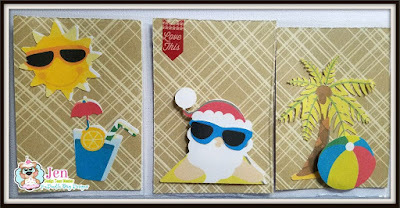 Today I have a Christmas in July project to share with you. I recently decided to swap mini pocket letters with a pen pal and the theme is Christmas in July. Now while I love this file I am not overly impressed with the outcome of this project and feel as thought the print and cut feature was not the best option, however take a look and then let me know what you think. This project uses the "Beach Santa" file from Kadoodle Bug Designs and while this file is super cute the quality of my print and cut was simply not there. Here is what the whole file looks like, just in case you are feeling in the holiday spirit. Now the file only came with cut images so in order to use the print and cut feature (which saves time, but again doesn't always look the best) I had to piece together the images in Design Space and then use the "flatten" button. This feature makes it super easy to convert any image into an easy print then cut. Thanks for stopping in to see my project today. Happy Crafting! This past weekend we had a kids in free day at our local museum, so of course I grabbed the boys, packed up the car and heading out to explore this new museum (well at least new to us.) The museum was nice, but our favorite room was of course the arts and crafts room which led to the perfect opportunity for some memory keeping. 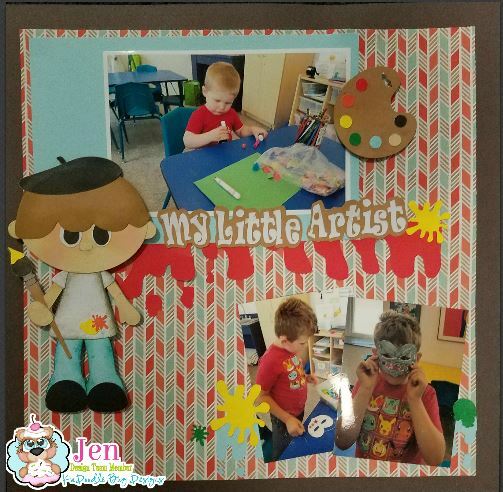 This layout is a 12" x 12" layout and features die cuts from the Kadoodle Bug "Little Artist" file. I love using cut files to decorate larger layouts because the images tend to be larger and much easier to piece together. One of my favorite parts of this set is how she incorporated extra little paint splatters so I could embellish. I decided to leave off the journal notes because I have more photos which I will add to an additional/matching layout and I will tell the story on that page. Thanks for stopping by today. I hope you were inspired to head out and create something beautiful. Welcome to another wonderful challenge day over at Creative Knockouts where this week we are challenging you to use Washi Tape on your projects. As always we have a wonderful sponsor and this week it happens to be Crafty Sentiments who is generously giving one lucky winner 3 prize images so make sure to come on over and play along. For my project I have decided to use the image Toby in Pot which is a really cute image. Now I went to color this image in using my alcohol markers and I started to have some trouble with them leaking and being extremely wet, so please excuse the large outline that the pot has. So I started by printing this image out using my Cricut. I then layered it onto some white cardstock to provide a little more draw to it against that craft background. As far as coloring in the image I sponged the blue, green, and brown background and then colored in using Alcohol markers. I found some green glitter washi tape in my stash and thought this would be perfect to pair with those flowers, which I cut out using my Cricut. I then also found a "smile" sentiment which was cut out using a die and adhered that the the front to provide a sentiment. Oh yea and as for the card base, I used a Cricut cut for that as well. Thanks for stopping by today and make sure to stop by Creative Knockouts and play along with us. Today I have another new project to bring to you!! I know it's exciting to have so much new stuff going on in one short week, isn't it?! 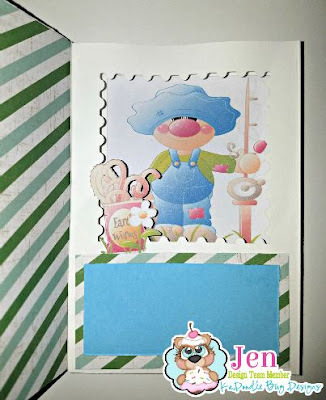 Today I am showing off a project that I made for a swap and this one just like my one sheet mini album is a great way to get some smaller goodies off to your pen pals. These little 4" circles are called "Mini Loaded Circles" and are so super simple to make. To make them simply start off by cutting two 3.75-4" circles. Now I left a little room in there because you can either use stacking dies or you can use your die cutting machine, like I did. One of these circles is going to turn into your base and the other one will be glued to the base and used as a pocket. The best advice I have for you on this step is to glue all but the flat top, so that way you can slide your goodies right into the pocket. Also if you are more of a visual person then you can search around on YouTube, or even request one below, and I will be happy to create a video showing this technique. Since the swap was to create three of them I also wanted to show off the other two that I created. It's hard to choose a favorite one but the colors in the one below are really pulling me towards it. 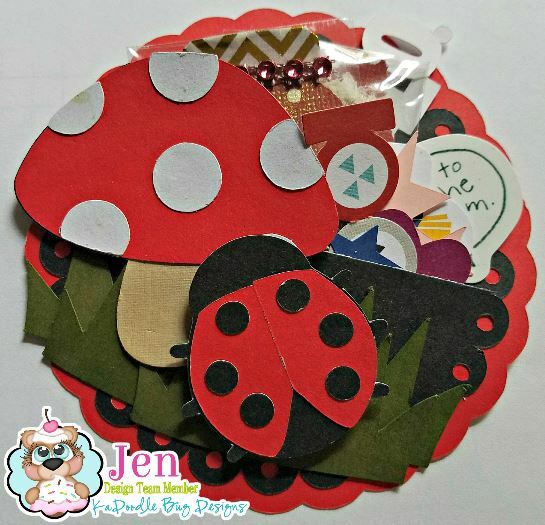 For all of these Loaded Circles I used the Kadoodle Bug Designs "Little Buggies" file set. This set is super cute and can be found here. Thanks for stopping by today and I hope to see you back here tomorrow for a brand new Creative Knockouts challenge! Hello and happy Monday to everyone out there. 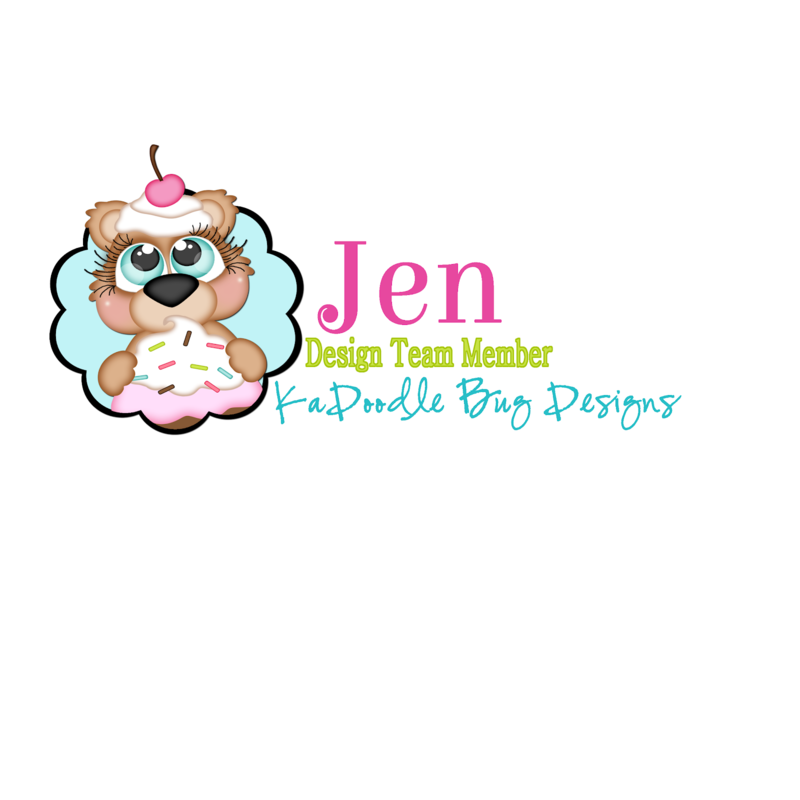 Today I have some awesome news, I am one of the newest members of Kadoodle Bug Designs team!! I have been playing around with these files for forever now and I am so excited to officially be joining the team. If you are unfamiliar with KDB make sure to head on over and check out these designs, best news is that there is always a daily freebie!! 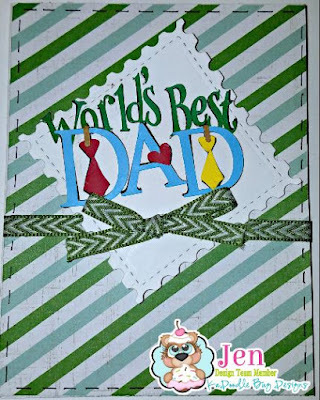 Ok so now moving on to my first DT project I have decided to use Jennifer McGuire's Shadow Card tutorial and create a Father's Day Card. For this project I have decided to use the "World's Best Dad" file located here. This file is not only adorable but also perfect for my wilderness boys to pass along to their dad while they are at their annual camp trip this coming weekend. As I mentioned this is my first attempt at a shadow box card and I LOVE making these cards. If you have never tried this, warning it is addicting, head on over here and give it a try. For the outside I decided to cut the file out and piece it together. Then on the inside, because I was unaware of how the card would work out, I decided to use the Print and Cut feature. Thanks for stopping by today and sharing some great news and fun projects. I hope to see you back here on Wed. for my next KDB project. As many of you know I live in Upstate NY and right now is the perfect time for camping, which may be what inspired this card. For this card I decided to use the Round Camper stamp which I colored in with alcohol markers and then fussy cut out. To add some more interest to the card I popped this camper piece up using 3-D foam tape. For the background of the card I used the Fir Trees stamp which I stamped in a green ink. 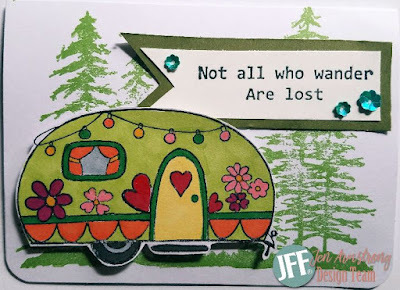 I then stamped the Not All Who Wander are Lost sentiment stamp onto some white paper and matted it onto the forest green. Finally I accented with some flower sequins and rounded the corners. Thanks so much fro stopping by today. See you back here soon and Happy Crafting! Today I wanted to come on and share a video that I created a while back on how to make a One Sheet Mini Album. These little pint size albums are perfect for sending along goodies to your besties or even for keeping your own die cuts in order. The album is made using one sheet of double sided 12" x 12" paper so each pocket ends up being roughly 3"x 4." You could easily adjust this album to make less pockets that are larger, however since I love working with even numbers I have decided to opt for 8 pockets. While you are over at my YouTube channel please make sure to subscribe and share. I always have great tutorials up and I love to teach and connect. Welcome back and Happy June! It's hard to believe that it's June already. 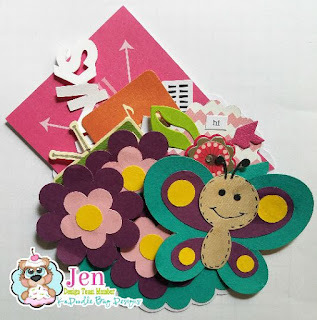 Today is my day to design for the Just For Fun blog and I have a beautiful stamp and a beautiful card to show you. So as you may, or may not know, I take part in a couple of craft swaps and one of my new favorite swaps is called a kit swap. If you are not sure what this is let me break it down for you. We split up into teams and each team has a "creator." The creator has the job of creating kits for all of the members, these kits have to be created from the same materials. Then she sends them to each of us. Once we receive the kits we have to create a project, usually a card, tag, or page layout which is specified when you join the event. The fun part is seeing how many different creations can be made using the one kit. So anyway, long story short, today's card came from that kit. Now I should also mention that you receive 5 different items in each kit, all of which must be used, but then you can also add up to 3 of your own items...in this case the Just For Fun stamp, Dream Girl, paired perfectly. So for the image I simply took some watercolor pencils and a blender pen and I colored in that beautiful image. I found that the watercolor pencils work best when I color the heaviest on the top then use the blender pen to drag the color to the lighter areas. I then went ahead and stamped the sentiment onto the white banner that came with the kit.